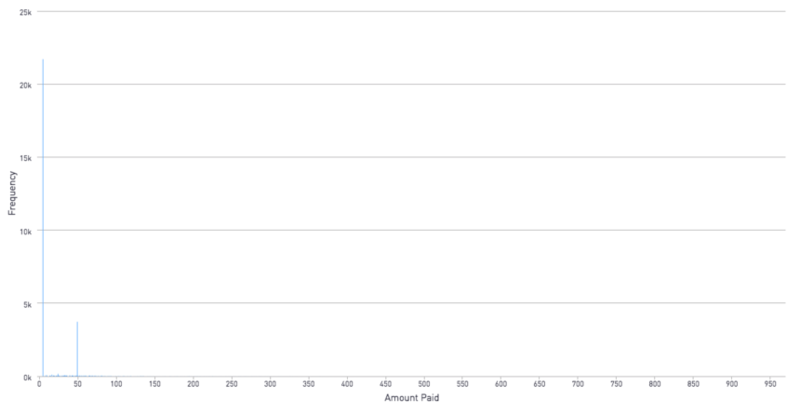 Let's say you have data set that is heavily skewed, like this hypothetical data set here plotting the amount users paid on a fictional gaming app. As we can see here, a bar chart isn't a great way to visualize the data. Most users fall into the 99 cent bucket, so it is hard to see how many users fall into the other smaller buckets skewed to the right of the chart. There's a couple ways we can re-display the data. 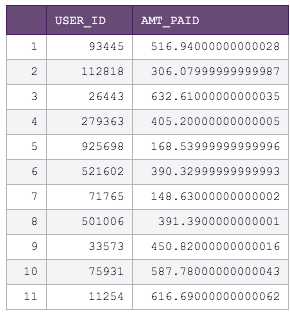 Now, we can easily see that well over half of users have paid 0.99 cents, and the higher paying customers make the top 20% of the data. Here's the Python 3.6 code on how to get that information. Assume the information with the user ID and the amount they paid is stored in a dataframe called df. # Use Periscope to visualize a dataframe, text, or an image by passing data to periscope.table(), periscope.text(), or periscope.image() respectively. thanks for the very useful tutorial! Assume the information with the user ID and the amount they paid is stored in a dataframe called df. What does the SQL Output that constitutes the df look like, in terms of structure? I'm getting results that don't quite look right (values are too high and linear) with my own data. Perfect, thanks. I was under the mistaken impression that I would need to pre-aggregate the base table. Now everything is working as expected.